We pushed our way through the thick air weighed down by the heavy humidity. As we stepped into the bus station of Puerto Iguazu excited to be heading towards Iguazu Falls, one thing started to becoming increasingly clear, we weren’t alone. As we squeezed our way aggressively through the crowds we found solace in the open spaces standing in the bus. 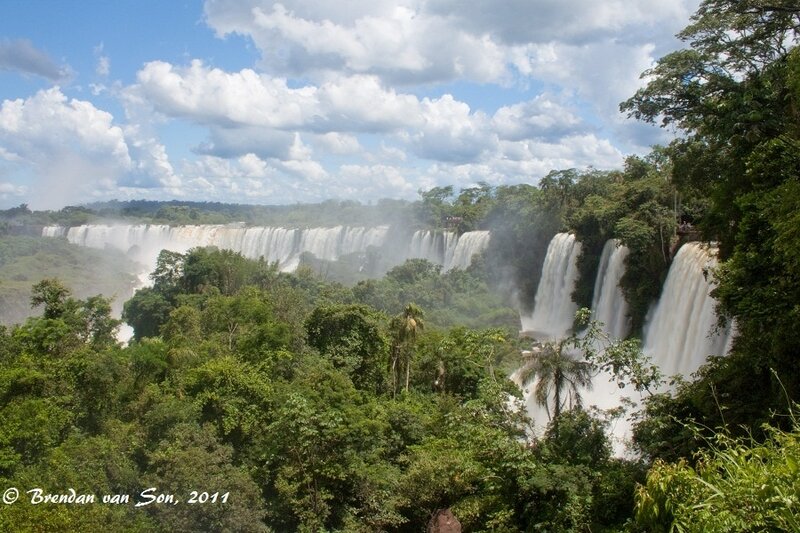 As we stepped out of the air-conditioned refuge of the local bus we were there, Iguazu Falls. Our guide directs us to a train stop, and tells us that we have to load on the train in order to get to the “Devil’s Throat,” the most famous section of the falls, first, before the crowds pour in. Unfortunately, I am pretty sure that they beat us. After waiting a half an hour of standing in line to board the train we cruised through the green foliage that grows unbashfully from the bright green soil. For a moment I begin to think of Jurassic Park, as the moment feels a lot like that. Our train pulls into the “Devil’s Throat Station” and we are herded through off the trains and onto the boardwalks that lead to one of the places that would surely fit on my bucket list if I had one. Single file, we waddle like penguins along the boardwalk across rivers of murky waters and beautiful green flora. As we wander closer I can see the spray rise from the river, and senses tingle. 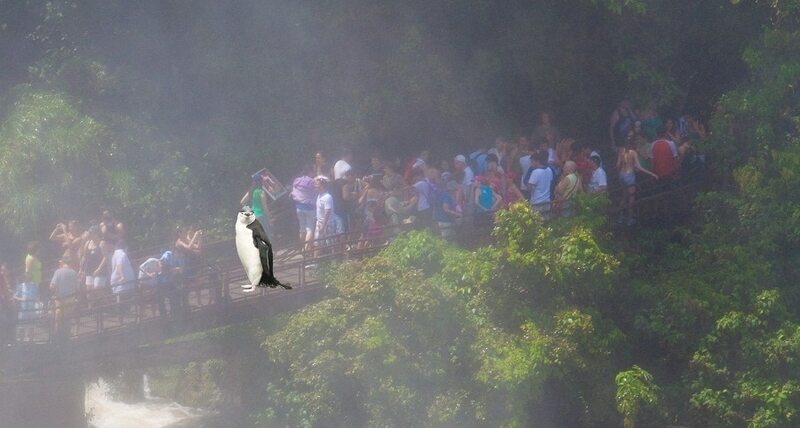 I remember the first time I visited Niagara Falls. I was driving a rental car from Toronto, and had no map, nor an idea of where the falls sat. As my car rolled down the hill into town I saw the falls for the first time. I remember the way the falls managed to draw the words “wow” from my mouth as I lost all attention to the road and the car I was driving. 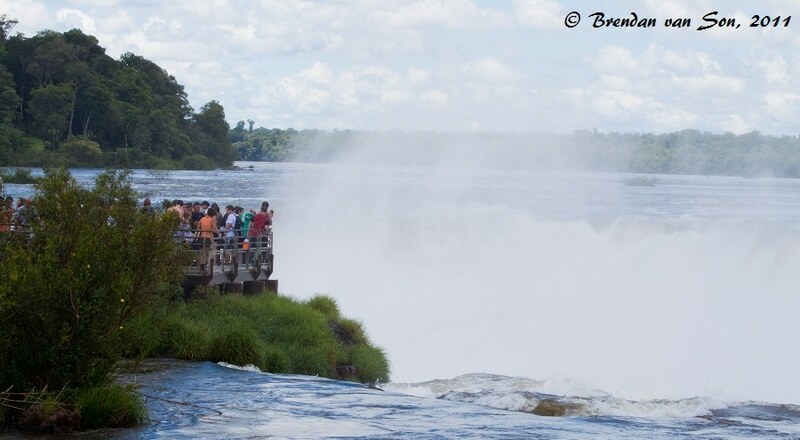 Unfortunately, at Iguazu it was the sheer amount of people that made me say wow. On arrival to the platform, all that could be seen was the back of the heads of people lined up on the rails unwilling to give up their positions. After a couple of minutes of frustrated patience waiting for people to clear their spaces, and a chance at a view of the falls for the first time, I realize just why people were unwilling to move. Perhaps they were unable to. At that moment I understood the need to stand and simply drink it all it. Iguazu Falls are not one simple fall from a river, but rather a series of falls, ranging from thunderous ones to thin bridal veil falls. 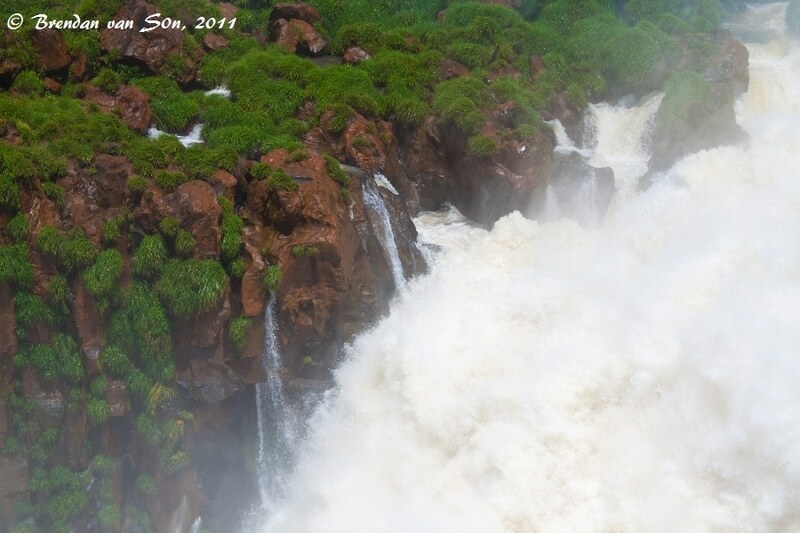 The water drops on several levels through lush vegetation into thunderous pools of churning water below. The force of the area is impossible to capture on any mode of video or film. Resulting mist that hangs is tossed through the air by light winds giving moments of refreshment from the sweltering heat. After escaping the overcrowded boardwalk of the “Devil’s Throat” I realized that the park was much more than just the first boardwalk. Trails for over 6 km through the forest all providing equally inspiring views and vantage points over the wide spread falls. 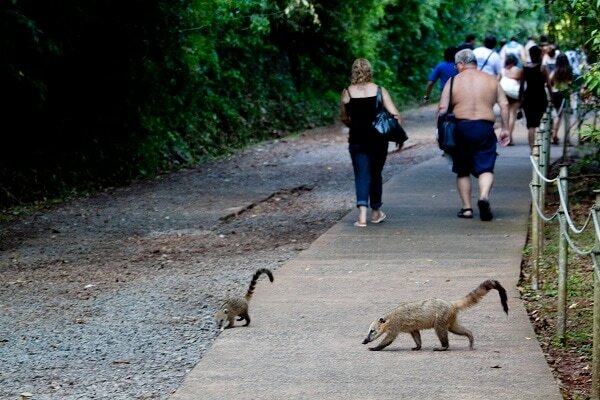 Friendly coatis march along the trails and pose happily for pictures. Large iguanas waddle their way along the red soil soaking in the hot sun. And as the day goes on, the smiles on the faces of visitors stretches in satisfaction. Iguazu Falls is a wonder for a reason: it is absolutely incredible. And it would be easy to let the crowds overwhelm, and even ruin, your experience. But a little patience will go a long way to increasing your enjoyment of this magical place. 6) Pack in lots of water. A bottle of water inside the park costs about 2.50US, whereas outside it costs around 80cents. How do you get to Iguazu? You might want to consider doing a small group tour. If you’re interested in this idea, check out who I went, Gecko’s Adventures. These are amazing shots, clearly a candidate for natural wonders of the world. Thank you for being honest about the crowds. One of the things I like about your writing is that you don’t obscure the negatives of travel. It is amazing there! Great pics…hey, wait a minute, there were no penguins there when I went!! Cheers! I went in May 2009 and it was not too crowded at all! Still pretty hot, though. The falls really are mind blowing. Did you see the hilarious signs warning you that the coatis WILL bite you? They were way friendly than the sign made them sound! Ya, the signs are hilarious. It was extra crowded when I was there because it’s the high season. Unbelievably crowded.